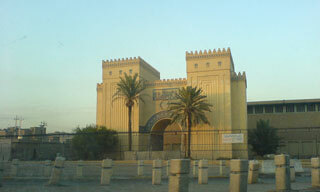 The National Museum of Iraq is a museum located in Baghdad, Iraq. Also known as the Iraq Museum, or the Baghdad Museum, it contains precious relics from the Mesopotamian civilization. It was looted during and after the 2003 Invasion of Iraq. International efforts led to many stolen artifacts being returned. After being closed for many years while being refurbished, and rarely open for public viewing, the museum was officially reopened in February 2015. This article uses material from the Wikipedia article "National Museum of Iraq", which is released under the Creative Commons Attribution-Share-Alike 3.0 License.